I am embarrassed to admit that the succession of what I ate yesterday afternoon went something like this: chips-> pizza-> brownie cookies-> Oreos. I think I squeezed a peach in there somewhere, so it wasn’t really all that bad, but I still felt I owed it to my stomach to eat something with substance. 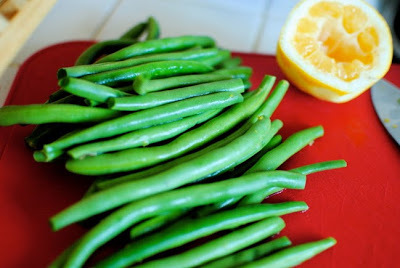 A home cooked meal was in order, and I knew I wanted to use these lemons Denise had given me from her tree. 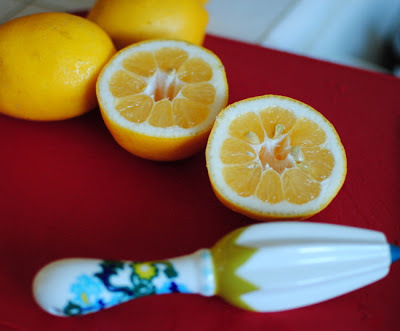 Lemon is such a perfect flavor for summer. It keeps things nice and light. In fact, if lemons had a middle name, it would be Refreshing. I made garlic roast chicken with rosemary and lemon (a recipe courtesy of Rachel Ray). Seriously, maybe I am just the slowest cook ever, but I have no idea how she makes all her meals in 30 minutes. Mine took so much longer! Greens taste so much better when all you’ve eaten all day is hydrogenated oils and canned pineapple chunks. 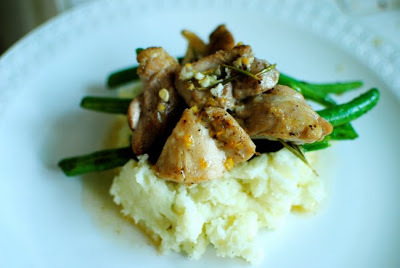 Who knew lemon zest, rosemary and crushed garlic over seared chicken could be so pretty? 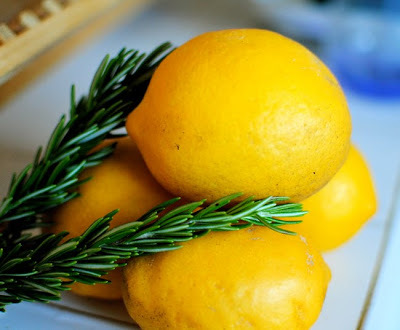 My favorite part of cooking the meal was the very end when I used the extra lemon to wash my hands with (a little trick I picked up from my mom). The smell of fresh lemons is so irresistible, I couldn’t stop smelling my hands the entire night! Preheat oven to 350 degrees F. Sear chicken for color. Arrange chicken in a baking dish, 9 by 13-inch. 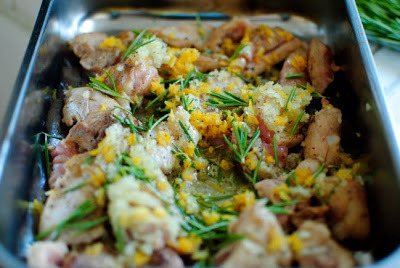 Add garlic, rosemary, extra-virgin olive oil, lemon zest and salt and pepper to the dish. Toss and coat the chicken with all ingredients, then place in oven. Roast 20-30 minutes. Add chicken broth and lemon juice to the dish and combine with pan juices. Return to oven and turn oven off. Let stand 5 minutes longer then remove chicken from the oven. Place baking dish on trivet and serve, spooning pan juices over the chicken pieces. Wow, I'm impressed at the final result! My cooking never looks quite that picture perfect. I can't wait to try this recipe myself; it looks awesome! looks so yummy! def going to try it! Ok so I might be a fail..but I have never had seared chicken. but this looks amazing!